Emergency Services - When Is It Time To Call The Vet? When it comes to your pets, it’s not necessarily a matter of if you will need to call the vet in an emergency, it’s a matter of when you will need to call the vet. If you’re in the Los Angeles area and you find yourself in an emergency situation, 911 Vets can help. Our mobile vet clinic makes it easy to get the help that your pet needs. Instead of worrying about getting your pet to the clinic in time, 911 Vets can come to you at all hours of the day and night. When you’re in need of an emergency vet clinic, call 911 Vets at 310-341-0216 right away! In an emergency situation, it’s not always clear when you need to call the vet, which is why in today’s post, we will cover a few situations in which you should call the vet for assistance, and how you should react in an emergency situation. If your pet experiences any of the following situations, be sure to call 911 Vets right away. 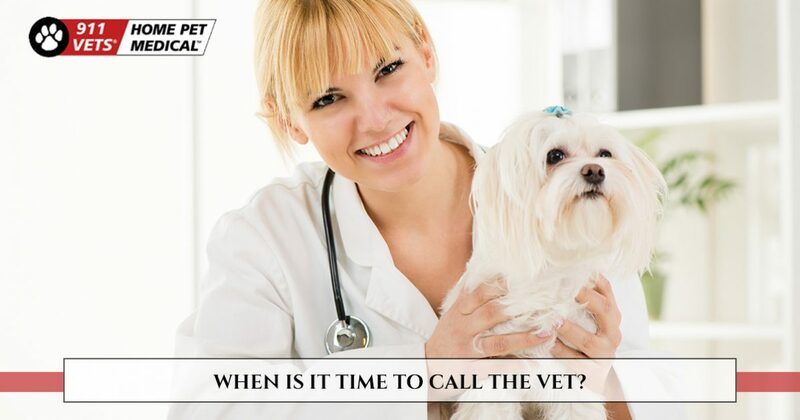 The best rule of thumb is that it is never a wrong time to call the vet. If it’s an emergency situation and you’re not sure how to react, the best thing you can do is to call the vet, even if you’re not sure if it is necessary. By calling the vet, you have your pet’s best interest at heart, and can reduce the risk of more serious complications down the road. When it comes to your pet’s health, it’s better to be safe rather than sorry. You spend a lot of time with your pet. Even if you’ve only had your pet for a few days, it doesn’t take long to pick out distinct personality traits. With that in mind, you know your pet’s personality the best, so if there is something unusual in the way your pet is acting, then don’t hesitate to call the vet, even if you suspect that it’s nothing. It’s also important to keep in mind that if your pet is exhibiting signs of illness or injury, the problem could be worse than the problems he or she is exhibiting. Because illness or injury is seen as weakness and vulnerability in the wild, animals have become experts at hiding signs of illness. Aside from calling the vet, the best way to help your pet during an emergency situation is to be prepared. It’s difficult to be prepared for every possible situation, but there are a few things you can do to ensure that your pet will get the proper care he or she needs. The first thing you need to do is find a vet that you trust. Many vets only operate during the day, which is why it’s always a good idea to have the number for a 24-hour vet in an easily accessible location. Another easy way to ensure that you are prepared for an emergency is to ask your vet for advice. When you go to the clinic for your next appointment, ask the vet what you should do in an emergency situation. This is also a good chance to see if they have a 24-hour clinic that they recommend. As we mentioned above, it can be difficult to identify an emergency situation and react accordingly. With that in mind, if your pet is showing signs of any of the following symptoms, it’s important that you take them to the vet right away. Known exposure to dangerous poisons – Unfortunately, there are many substances around your home that can be poisonous to your pet. Anything from rat poison to chocolate could lead to serious complications if ingested. If you suspect that your pet has eaten something poisonous, don’t wait for the symptoms to get worse before you call the vet. Not eating or drinking – Depending on your pet, not eating or drinking could be a major sign that something is wrong. Some pets eat everything in their bowl within minutes, while other pets choose to savor their food and make it last for hours. With that in mind, in most cases, not eating or drinking within in a 24-hour period is cause for concern and you should visit the vet. Vomiting and diarrhea – If your pet is vomiting or has diarrhea, it could indicate that there is a serious problem, especially if either contains blood. If it only happens once, it may not be something to stress over. However, if your pet is vomiting or has diarrhea repeatedly, it could lead to severe dehydration. Difficulty breathing – Breathing difficulties, strange noises when breathing, or any other irregularities in your pet’s breathing need to be addressed right away by a vet. These are just a few of the common emergencies that need to be addressed by a vet. If your pet exhibits any of the symptoms listed above, you need to seek treatment from a vet right away. Luckily, if you live in the Los Angeles area, 911 Vets can help. Our mobile vet clinic is available 24/7. We offer all the veterinary services that you would find in a normal vet clinic, except we bring our services to you. Call 911 Vets at 310-341-0216 today.